Where had I recently read about Dutch salt mining in the mid-Atlantic? 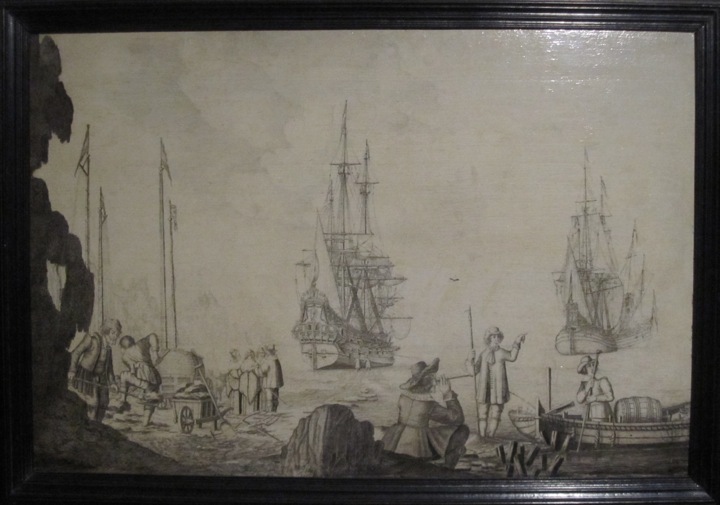 Or 17th-Century nautical scenes captured by the penschilderingen technique? Why was I certain the swarthy sailor was drinking a Dutch microbrew? I had to go home and do a bit of research before it hit me, but it was stumbling on this next image by Sillemans that called it all back to mind. It must have been the title “Ships in a Breeze” that tipped me off. I was immediately reminded of the Chadwick Family Papers essay on my bookshelf, “Upset by the Big Wind,” which details the prestigious New York family’s collection of Shipwreck Memorials. Of course, the “Big Wind” belongs to a much later moment in history—January 6, 1839, to be precise—when, according to the Chadwick editors and curators, Lytle Shaw and Jimbo Blachly, a “freakish hurricane… devastated ships in the Shannon Estuary” off the coast of Ireland. 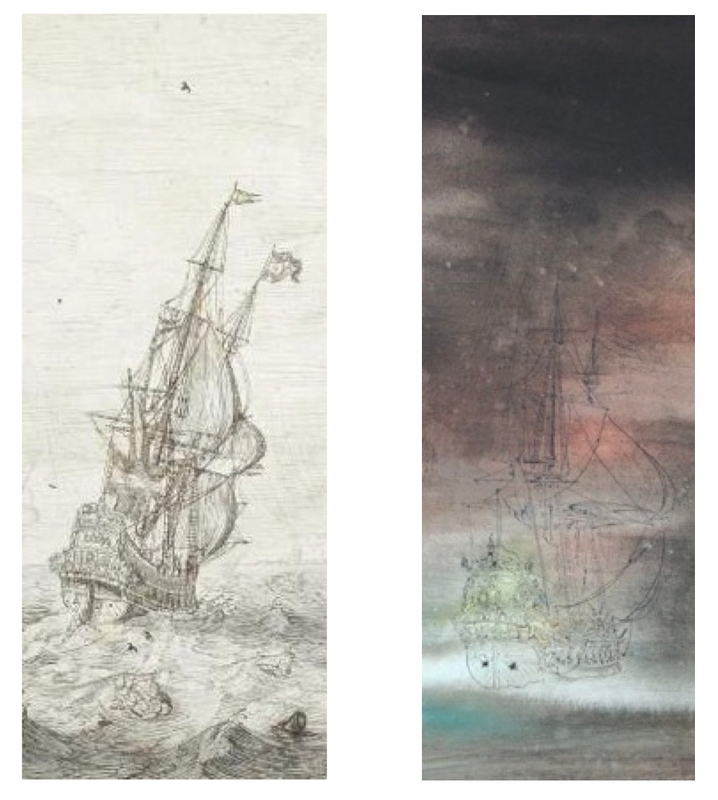 L: Sillemans tries to imitate engravings, but around 1600 he says, “Well, I’ve gotta make drawings,” but then he imitates the art of engraving, so it looks almost like an engraving. The whole way he makes the pen with six lines become thinner and then so on, is really imitative of engravings. G: They do use an offset transfer technique, so there’s a drawing, a preliminary drawing made, right? L: Yeah, but this is with chalk. G: Yeah, with chalk, and then they’re essentially tracing that with the quill. L: Yeah but they did the hatching lines. They never touch each other. It’s [an] incredible kind of technique. G: And then it’s, oh yeah, yes certainly that’s why that you get this sense of Photoshop. L: I couldn’t solve it, why pen painting was only used for marine themes, almost never anything else, and then it becomes a kind of tradition, and nobody thinks of doing it on another subject. G: For a contemporary artist this is so interesting, this sense of space, and that these things disappear and come back, and again this idea of ghosts, in terms of technique that we don’t really know. It seems so inventive and contemporary. G: So, you’re saying there’s not one full image. L: Yeah, that he always has to change things and that he adds things. G: But it’s never the idea of a total vision. L: No, of course, what you could say is “I start with just the ordinary thing I have on copper plate, then I go make variations,” but if you start with variations and small part counter proofs time and again, it’s funny that sometimes it’s very confusing. I think nobody else does it. He is pretty remarkable in the 17th century. The idea of imitating engravings or [knots?] and changing things. It’s about art, what can you do with art, what is imitating, how can you change things. 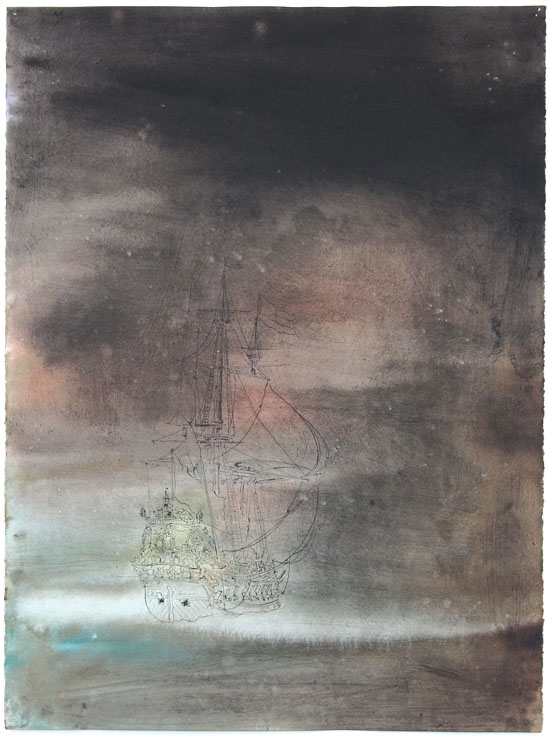 On the subject of copies and originals, I’d like to consider the next known Experiens Sillemans piece, “A Flute Ship and a Warship in a Port” alongside a work from the Chadwick’s Collection, “Early Morning Yawl Boat Brawl,” below. 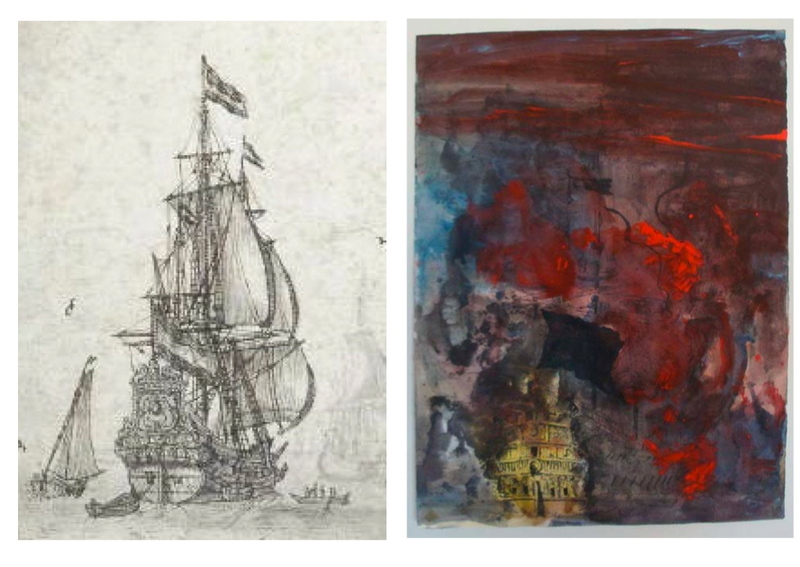 Even more striking is the resemblance between the warship in the left rear ground of Sillemans’ “A Flute Ship and a Warship in a Port” and the flaming hull featured in the Chadwick’s “Tinder Box.” The redeployment of the warship in the latter composition brings the gravity of this historic Dutch salt mining disaster to its fullest expression. 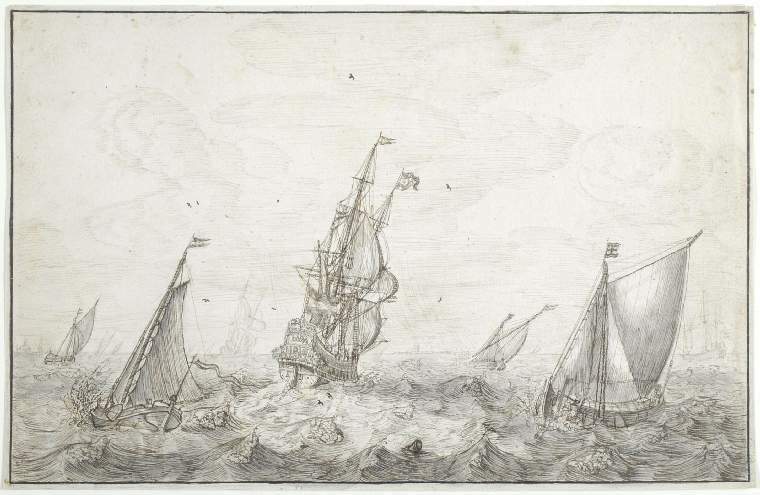 The hull of the warship, enveloped in flames, but with its ornate woodwork still visible through the fire, serves as the punctum to one of Sillemans’ most powerful compositions (At this point, we conjecture the latter composition is made by Sillemans himself, though it could, of course, be the work of a late imitator, or perhaps, a rival draughtsman who swiped Sillemans’ counter proofs?). The truth is, of the connection between Experiens Sillemans and the Chadwick (or Chadwijk) family, we know very little. 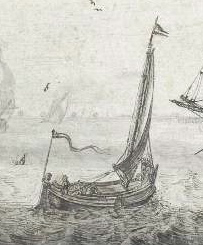 It would not surprise me in the least, however, if it were discovered that Sillemans and the Dutch Chadwicks were more intimately connected than I might have guessed. 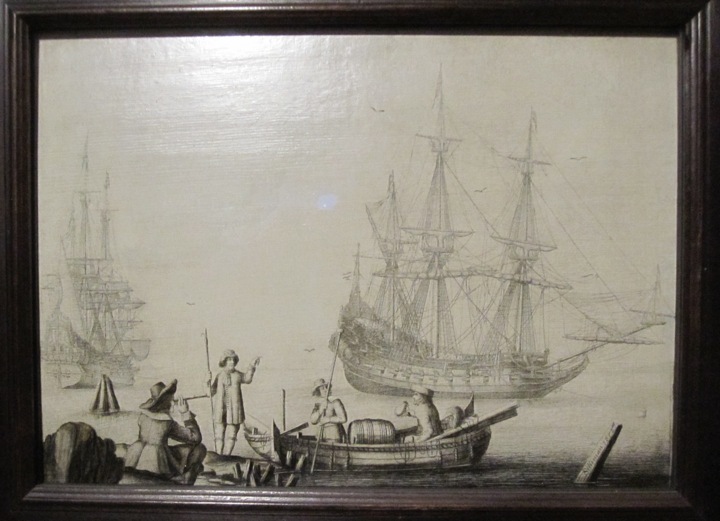 Knowing what little I do about the history of the family, I would even credit the conjecture that the penschilderingen works in the Chadwick’s Collection are elaborate forgeries executed by a member of the family. In support of which theory, I return to the seated figure in the canoe from Sillemans’ “Dutch Salt Diggers (Klipzoutwinning).” Without any indication from the painting itself, I knew the sailor to be drinking a Dutch microbrew because I had seen him elsewhere — at least, in a sense, in the Chadwicks’ “Golden-Age Microbrewery” model (below). The most cursory comparison of the visages of these two inebriated Dutchmen should suffice to convince any reasonable person of their relation. 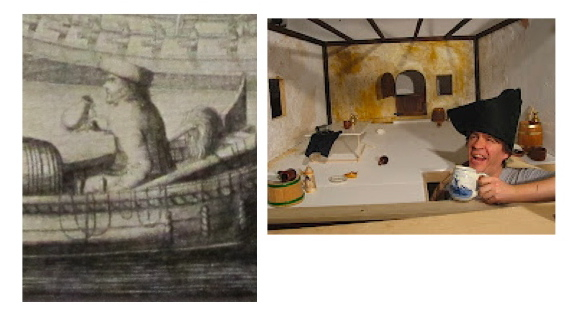 Perhaps the 17th-Century Chadwijk depicted in the canoe was also a member of Sillemans’ studio? Or perhaps he was a studio model who somehow acquired a number of Sillemans’ works and passed them on to his heirs and inheritors? Without further surmise, we await report from Shaw and Blachly.